Among Windows Phone owners, a great many also have Xbox 360 consoles. And the most popular first-party franchise for the 360 is undoubtedly Halo. We first caught a glimpse of Halo 4 in motion during Microsoft’s E3 keynote earlier this year, and today the game has arrived at last. That’s right, you can walk into a store right now and pick up Halo 4. If you’re a dedicated fan, you probably did so even before reading this article. Everyone else, read on to learn about the latest (and likely final) Halo release of this console generation. In case you somehow missed 2007’s Halo 3, a plot recap might be in order. At the end of that game, Master Chief destroyed a massive alien called the Ark in order to defeat an entity called the Gravemind that controlled one of humanity’s greatest threats, the Flood species. In doing so, the ship carrying the Master Chief and his AI companion Cortana was hurled through a portal into deep space. Humanity assumed them lost, though the Chief had actually gone into cryostasis to await a rescue. In Halo 4, Master Chief awakens on an alien world to encounter a new threat: the Prometheans. These strange and different enemies possess their own unique weapons (which players can also wield) and will require different tactics to defeat than previous enemies. On top of that, the Covenant also return (but not the Flood) in more dangerous form. The campaign features impressive cinematics, a greater focus on story, and a faster pace than Halo 3. That’s all quite welcome, as I was slightly underwhelmed with Halo 3’s disjointed campaign story. 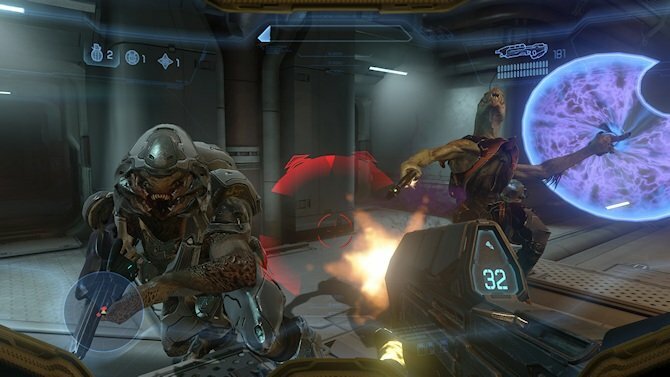 Like several previous games, Halo 4 supports 4-player campaign co-op with up to two split-screen players on each console. The campaign sadly lacks Matchmaking though, so you’ll need to invite your own friends if you want to experience the story as a team. 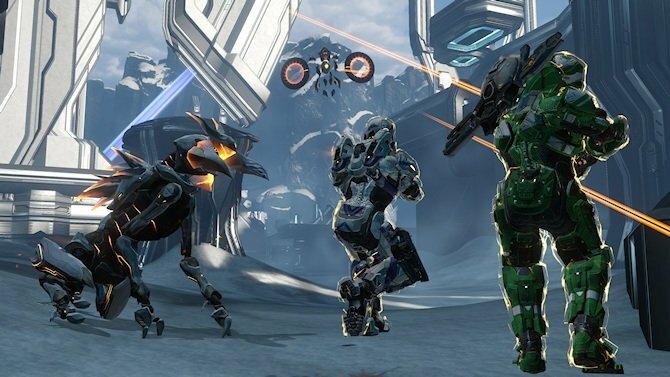 The popular cooperative Firefight mode has been replaced with the brand-new Spartan Ops mode. This revolutionary feature promises to deliver five new story-based missions per week for the foreseeable feature, all free. It seems like a great way to keep non-competitive players engaged with the game just as long as competitive ones. Naturally Halo 4 features the most advanced competitive multiplayer features the series has ever seen. Versus multiplayer is now presented as a training exercise between Spartans aboard a giant UNSC ship. Tying all three modes (Campaign, Spartan Ops, and Multiplayer) together is a brand new progression system. Completing challenges in any mode contributes towards your very own customizable Spartan’s progress. The further you advance, the more visual customizations and new abilities you’ll unlock. For more details, check out Co-Optimus’ Halo 4 Co-Op Review and Co-Op FAQ. Now that Halo 4 is out, an update to the mobile Halo Waypoint app is all but guaranteed. One of the Waypoint’s current features is Halo ATLAS, which provides SmartGlass-like functionality for Halo Reach. Microsoft has the choice of adding Halo 4 support to their recently launched SmartGlass app or Halo Waypoint. Both apps are cross-platform rather than Windows Phone exclusives, so neither option will benefit our platform more than the other. Microsoft hasn’t said one way or the other which route they’ll take on Halo 4 mobile integration, so we’ll have to wait and see. Let’s just hope they muster up enough confidence in Windows Phone 8 to finally release a mobile Halo game. Considering WP8 will be home to graphically intense first-person shooters like N.O.V.A. 3 (itself a Halo clone) and Modern Combat 4 (both recently announced by Gameloft), the big MS really has no excuse not to throw its own mobile platform the bone that fans want and deserve. Previous mainline Halo games came the series’ creator Bungie Studios. Halo 4 marks the first game to come from Microsoft’s new studio 343 Industries. By all accounts, their inaugural game not only lives up to series expectations, it exceeds them. Pick it up at retail and I’ll see you on Xbox Live!